All Worthing Plumbing & Heating Engineers have been trained to the highest standards by Worcester Bosch to install and commission all of their products. You will also benefit from an exclusive 10 year parts and labour warranty when installing any Greenstar CDi boiler and Greenstar System Filter with either the Wave, Comfort I or II Control or one of the Worcester Greenstore cylinders . The Worcester Bosch Greenstar range of boiler is the one most specified boilers due to the reliability and the fact that they fall into SEDBUK A RATED range, meaning that your new boiler will use less energy. Generally these boilers are over 90% efficient. Worthing Plumbing & Heating is a family run business with over 25 years of experience and 3 heating engineers. We are an Energy Efficiency Installer and are Gas Safety and OFTEC registered in both Domestic and Light Commercial works. Our Team of engineers are all CRB checked and adhere to the buy with confidence scheme standards, set up by the West Sussex trading standards. 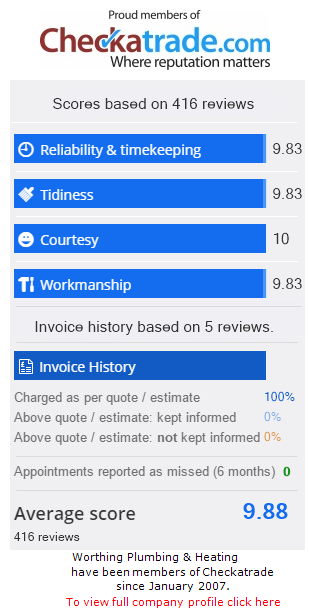 We are members of Checkatrade and feedback left by previous customers can be viewed on our Checkatrade page. With 3 heating engineers we offer a full plumbing service alongside heating works throughout the Sussex area. This also includes Boiler repairs and Servicing for all makes and models, Landlord Gas Safety Certificates, Condensing Boiler Replacements, energy saving system upgrades, full solar systems and unvented hot water systems. For more information or a no obligation estimate please call 01903 521173 or contact us..